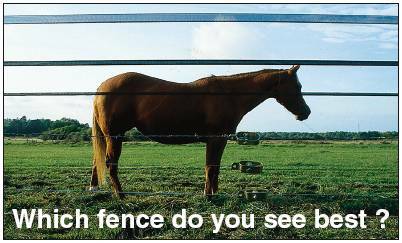 Horses have blurred vision. The horse can see in a radius of 350 degrees (man sees 180 degrees) but he has poor vision and very limited sense of perspective. His two blind spots are immediately in front of the nose, and directly behind him. 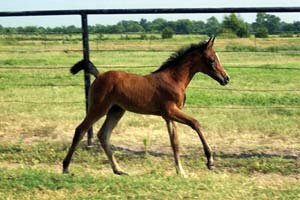 An electric fence that is difficult to see can be a hazard to the horse. his electrified fence and will exist for the rest of his life. AND 1 IS VISIBLE AND IS RESPECTED : THE HORSEGUARD TAPE. A horse's natural instinct is to flee from danger. A horse might not see or might ignore a smaller obstacle in his flight path. The 1.5-inch wide HorseGuard electrified tape creates that visual barrier. The tape is designed to represent the diameter of a large enough tree limb that the horse would both see and avoid running into. This visible barrier reduces dangerous incidents of frightened horses running into a fence. But if the horse does run into the fence, HorseGuard tape is designed to yield or break without causing injury to the horse. HorseGuardFence tape is resistant to 650 pounds of pressure.